Our guest this week will be Grandmaster Max Pallen - Founder of Senkotiros Arnis Eskrima Kali. 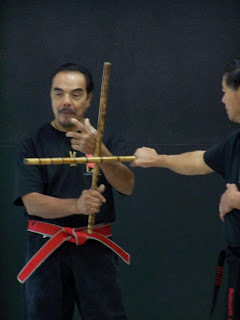 Grandmaster Max Pallen has been involved in the stick fighting arts nearly all of his life. Beginning in the Philippine Islands when he was a child. During the past fifty some odd years he has also trained under some of the world’s best stick and knife fighters In his version of Senkotiros he had minimized the strikes down to five basic methods. All inter-related and directly intended to coincide with singular blocking strategies.